I stumbled across this randomly, on one of the free channels our Roku has, I will confess I wasn’t even aware hand-drawn animated features were being produced outside of Hollywood before the end of World War II. While others, as early as 1917, had been based on various forms of stop-motion or shadow puppetry, Snow White was the first to use what we recognize today as traditional “animation” to tell a single, feature length story. After it came Gulliver’s Travels (1939), Pinocchio and Fantasia (both 1940), and in 1941, this was released, the first non-English language example of the genre. 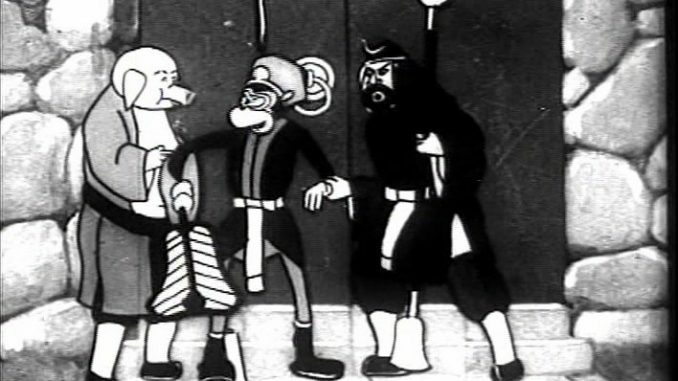 The Wan Brothers who created it were already well-established as animators of short films, but were inspired by Snow White to create a feature-length movie. As with Walt Disney, the Wans took a classic story as their inspiration: part of the the fantasy saga, Journey to the West, originally written by Wu Cheng’en in the 16th century. It has been adapted for the screen many times, both before and since, perhaps best known in the West through the TV series Monkey [although anime behemoth Dragon Ball takes a lot of inspiration from it as well]. This fragment concerns the appropriately-named Fiery Mountain, beset by magical flames that can only be extinguished by a magical fan belonging to a princess in a far-off land. Sha Wujing (Sandy, to fans of Monkey), Wukong (that’d be Monkey) and Zhu Bajie (Pigsy) go to request a loan of the fan. When rebuffed in a rather harsh manner, Wukong transforms himself into a ladybird and is drunk by the princess in a cup of tea. He then literally bounces around on her internal organs until she gives him the fan – only to discover he’s been pawned off with a fake. So Zhu Bajie shape-shifts to the form of her husband, Bull Demon King to try and get the fan that way. To modern eyes, it’s more an interesting curiosity, made under difficult circumstances – the Wan Brothers’ studios were located in Shanghai, which at the time was occupied by Japan. 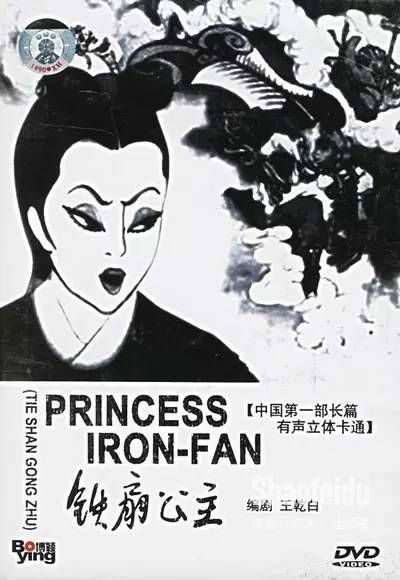 That didn’t stop the film from being exported to the occupying nation, where in turn it helped to inspire both Ozama Tezuka, the “godfather” of anime, and Momotaro’s Divine Sea Warriors, the first Japanese animated feature. In terms of animation, this is certainly primitive, even compared to what Disney were doing at the time. The style here probably has more in common with the works of the Fleischer Studios, not least the Princess, who has more than a hint of Betty Boop about her. The problem is that it’s not a good style to emulate. There are good reasons Fleischer’s Gulliver is virtually forgotten these days, despite being the second true animated feature. [Admittedly, the lack of any Fleischerland likely plays a part in the studio’s relative obscurity] It looks cheap with the corner-cutting occasionally very obvious. This has significant use of rotoscoping, a style with which I’ve never been impressed, and an almost too-fluid flow between frames, which sometimes gives the impression no-one has bones. Of course, being in black and white likely makes it seem older than the lush Technicolor product of Walt’s company at the time. Despite a stern opening warning that “This film was made for the purpose of training the hearts and minds of children,” it’s about as educational as a Wile E. Coyote short. Unfortunately, it’s considerably less amusing as well.